Looking for a tranquil day out, off the beaten path? It’s hard to do better than the Tancook Islands. There aren’t many services on the islands themselves (aside from a few craft shops and a small restaurant on Big Tancook), so pack a few snacks before you board the ferry for the 45-minute ride from the fishing village of Chester. At just $5 return, and with the chance of seeing whales, dolphins and seabirds during the journey, the boat ride alone is a great bargain but if you bring a tent it gets even better. You can camp for free at a wilderness campsite just up the road from the wharf. Your first stop is Little Tancook, followed by Big Tancook. ‘Big’ is a relative term here – the population rarely tops 200 people. Just 35 people call Little Tancook home. It’s fishing that keeps the islands going and not the boatbuilding industry, which once turned out famous schooners. Once on Big Tancook, your best bet is just to have a wander around. The roads are unpaved so a mountain bike is ideal for doing a circuit of the island, stopping at places like Southeast Cove for a swim or at the . The shoreline elsewhere is more rugged and everywhere there’s an abundance of wildlife and nature to enjoy. Before you leave, try and track down some of the famous Tancook sauerkraut. It’s some of the best around! Directions: The ferry leaves from a wharf in Chester, just south of Halifax. Times: Year-round. Monday to Friday at 7:10, 10:30, 3:40 and 5:30pm. Saturday at 1pm and 7pm. Sunday at 10am and 6pm. 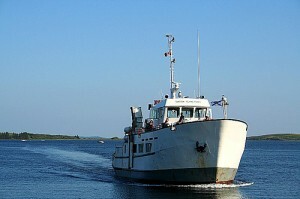 Note that the last sailing of each day to Tancook Island does not return to Chester. The boat overnights on the island.